Real Estate Machine has been offering web-based solutions to real estate agents since 2003. Our small yet mighty business has been an epic ride! It’s afforded us the opportunity to work together as a husband and wife team while giving us the flexibility of being home with our kids (and dog) while achieving our entrepreneurial goals. What more could you ask for! Russ has been practicing real estate since 1997 so he understands the business and the challenges you face which is one of the things that sets us apart from our competition. 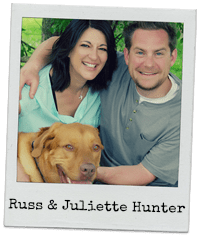 When you have a question or if you just need a little bit of motivation, you'll always get to speak directly to Russ who has actually used newsletters and social media himself to attract a steady stream of clients over the years. Real Estate Machine is located in Waterloo, Ontario (the technology capital of Canada) surrounded by leading software development talent but our clients are all over the U.S. and Canada. Your success is critical to our success so our customer service is second to none. Call 1-800-709-3847 today to find out how we can help you dramatically and effortlessly increase your business or if you're ready to get started right away, you can sign up here!